Being the reckoned names in the industry, we offer a sharp and durable array of Budding Knife that is delivered in standard sizes. We offer them in standard grades and ensures smooth operations. They are quality assured in nature and are corrosion resistant in nature. We deliver them in well-defined time frame. Being the reckoned names in the industry, we offer a sharp and durable array of Budding Knive that is delivered in standard sizes. We offer them in standard grades and ensures smooth operations. They are quality assured in nature and are corrosion resistant in nature. We deliver them in well-defined time frame. 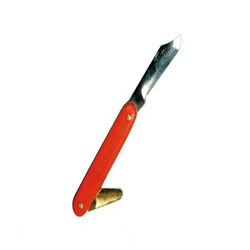 We are path forward in assembling and sending out Budding Grafting Knife. We utilize astounding stainless steel and sturdy plastic to fabricate these claim to fame blades. We offer Budding Knief to our clients. Its really important product for agriculture its durable and used for various purpose. - Made of high-grade stainless steel. - Perfect hardness and sharp ground blade. We are looking for queries from Navi Mumbai. Concorde Agro Sprayers Pvt. Ltd.